While traveling amongst human towns in previous lives, you, as an elf, dwarf or another race, have often been scoffed at to some degree. If the humans had a problem then, just wait until they get a load of you now. In this 3rd addition to Anomalous Races, you can be a creature from an all new perspective as you switch from the animal kingdom to the plant kingdom! 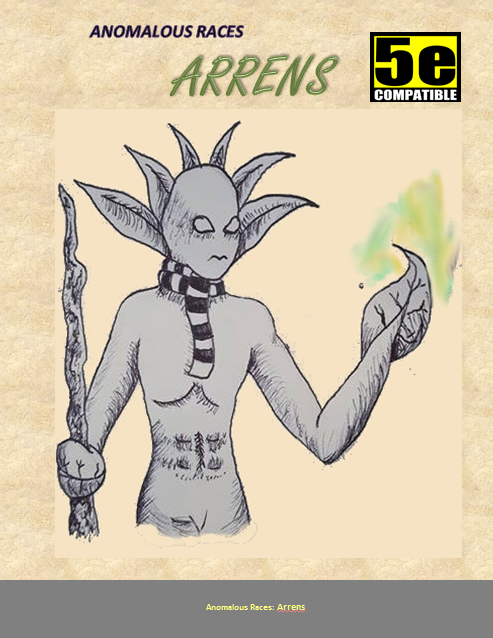 Arrens, in their recent history, were given a humanoid form to interact with the world in a new way! In the past, druids and other beings have been fscinated, to some extent, of the plant life living around them. In this new book, however, plants become fascinated with animal life. Anomalous Races: Arrens features new sections not found in previous additions that helps provide some ideas for players on how their individual arren character may think and feel about things. Additionally, other sections help DM's incorporate the race into their world by providing exciting plot hooks using arren people as a staple! Check out this new Anomalous Race and gain some perspective from this newfound beings!